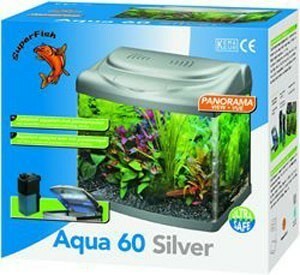 Attractive aquarium for goldfish, fan tails or small tropical fish. The curved panoramic screen gives the aquarium an extra spatial dimension. Supplied completely with filter and special PL light unit with 2 colours. Easy to install, and therefore ideal for the starting aquarium amateur, and fish friendly comparing to the traditional fish bowl. For keeping tropical fish, an aquarium heater (SuperFish Combi Heater) is necessary.